Enter a new product from SpinMaster to save the day! Bizu is a new line of beaded jewelry for girls.. But not just any beaded jewelry.. These fashion accessories do double duty as.. wait for it.. PETS! Seriously! They are so cute, and extremely trendy and hip! I have been waiting for a gift like this to impress my nieces! These things are so cute, I wish that they would have been around when I was younger! This is the Style Studio, kind of like the go-to station for creating your fashion accessories. It has four levels for you to store all of your beads, etc. You just twist to the one that you want, and press the button. 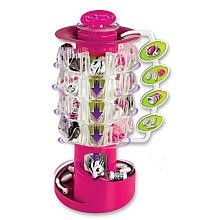 The bead that you want is dispensed and goes down the chute, until you have all the pieces needed. See what I mean? You create the bracelet, necklace, keyring, whatever you want.. Not only is it cute and functional as jewelry, you can twist it a few times to create a little pet! It's kind of like a balloon animal! I am so impressed with these little cuties! They come in different styles like Funky, Glam, Wild, etc. so you can match them to your girls' personality! I can not wait for my nieces to get to try these! I will be doing a follow up post soon to show you their creations! A big thanks to Spinmaster for putting me back in the "cool aunt" game! I was provided with a sample product in exchange for this post. Although a sample was received, all opinions are my own and no monetary compensation was received.